I’ve always hated “what if” questions. My husband, however, loves the “what if” game. What if I had a mullet, would you still love me? What if –insert movie star or famous musician name here — walked through those doors, what would you do? What if cows could talk? Now why these seem fairly non-threatening questions with obvious answers, I’ve still never liked this game, simply because it seemed like a waste of time asking questions that we already know the answer to. (It also might be due to the fact that when you teach middle schoolers you spend most of your day fielding questions that have obvious answers.) Today, however, I want to pose a “what if” that isn’t so easy to answer. I realize that Jesus was faced with this exact question and his response was appropriate yet hard fought in prayer. But sometimes my human mind thinks of course Jesus would say yes to whatever, He was God after all. But in Acts 21, Paul is faced with this same type of question. Paul had a trip planned the Jerusalem, but now was faced with the idea that when he got there it would go completely awry. Don’t know about you but I think I’d be planning a trip somewhere else or maybe it would be a great time for a stay-cation. Even Paul’s friends suggested he “not be stubborn and persist in going” (verse 12). Paul’s response was just as it should be and one that we must learn to make ourselves. Why all this hysteria? Why do you insist on making a scene and making it even harder for me? You’re looking at this backwards. This issue in Jerusalem is not what they do to me, whether the arrest or murder, but what the Master Jesus does through my obedience. Can’t you see that? Paul did go to Jerusalem. He was imprisoned for 2 years for something he did not do. Then he traveled on ship for a trial. The ship was wrecked. He went without food for two weeks. Then got bit by a snake. Sounds like the prophet had been right in his prediction of what would happen if Paul went to Jerusalem. But Paul was also right in his response as well. Throughout all the pain and fear, hundreds of people, both prisoners and authorities, heard Paul’s testimony and the news that Jesus died for their sins. Not only that but after the shipwreck, when they reached the island of Malta, many people were healed. Paul kept right on speaking of his innocence and preaching the gospel to anyone who would hear. What if that were me? (Back to the dreaded question) What if you were warned that the road ahead of you would be fraught with problems, pain, and life-threatening situations, would you still choose to walk the road? What if your pain and problems allowed others to come to know Christ, would you keep walking that road? Oh, right now, I believe all of us would speak a resounding and very spiritual YES! But honestly, I’m not sure we would go willingly and our yes would be more of a whisper and a prayer of please God don’t make me do this. Immediately, I can think of a road that God asked me to walk. I will say I didn’t get any warning that it was coming — in fact, I was blindsided by it. However, looking back I can honestly say that the road brought me exactly where I needed to be, but more than that I brought me to a place of joy. I have shared this life-altering painful road experience with my friends as well. Several asked me to walk their road with them. I did, but what I’m always so astounded by is that as we look back, we cannot believe the good that came out of the ugliest of situations. The marriage rocked by infidelity, drug abuse, and emotional wrenching. The forced career change accompanied by the forced income decrease. The sickness that threatens life and the future of a family. Some of these travelers had warnings, but others found themselves on their road unexpectedly. While we can ponder for quite a while the “what if” of walking a difficult road, I think there’s a better question. What if we didn’t walk that road? Where would our lives be right now? How would our relationship with Christ be: stale, vibrant, indifferent? I don’t know about you, but those are the roads I don’t want to avoid, for those are the ones that brought me closer to Christ and enabled me to discover who I am a little bit more each time. 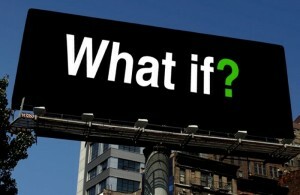 So maybe as it relates to my spiritual life, the “what if” game isn’t one I mind playing at all. At least it gives me a chance to tell about what God has done in my life and that’s never wasted time. What if you left a comment and told us how you felt about the what ifs in your life? This entry was posted in Faith Builders, Spiritual Encouragement and tagged Alicia C. Hall, Alicia Hall, blogger, encouraging others, writer on February 12, 2013 by aliciachall28.